After winning its first four games, the team has had three losses. 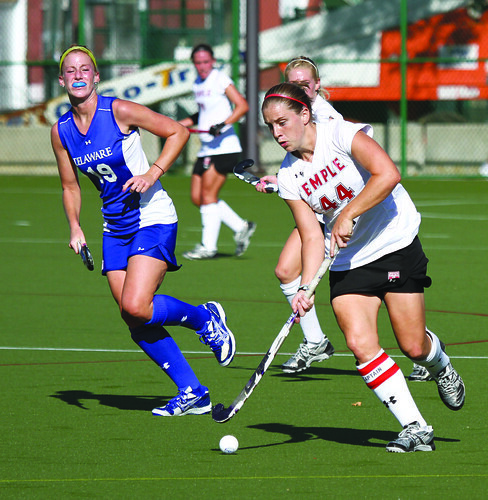 The field hockey team hosted a pair of games this weekend at Geasey Field, where they fell to Delaware, 2-3, on Friday and No. 15 Penn State, 3-2, on Saturday. The Owls entered Friday’s contest with a stellar 4-1 record. At one point in the season, the team posted three consecutive shutouts and two consecutive road victories against St. Francis and Georgetown before it suffered its first loss of the season Sept. 10 to Lafayette. The first half of Friday’s game was characterized by sheer aggression from the Blue Hens. Delaware controlled the ball for the majority of the half and was persistent in attacking the Owls. The team’s offense was sluggish and failed to get into a rhythm. With 23 minutes remaining in the half, the Delaware onslaught was at its peak when the Blue Hens came close to scoring on three occasions. Senior goalie Sarah Dalrymple and the Temple defense managed to make three stellar defensive plays to prevent Delaware from scoring. Temple was finally able to take control and threaten Delaware with 15 minutes remaining in the half, but it was unable to capitalize on a few close scoring chances. With eight minutes left in the first half, the Blue Hens made their aggressive style of play pay off with a goal on a corner opportunity by senior defenseman Michelle Drummond. Delaware went into the half with a 1-0 advantage. As the second half got underway, Temple sped things up on the offensive end. The Owls were able to get a number of scoring chances within the first few minutes of the half, including a corner opportunity which resulted in the ball going into the net and a point being tallied on the score board, but it was eventually ruled too high. Later, junior forward Bridget Settles notched her team-leading sixth goal of the season and put the game-tying point on the board for Temple, which remained on the board. Both teams played feverishly, trying to break the 1-1 tie. The rest of the half was characterized by multiple scoring chances and corner opportunities for both Delaware and Temple. Although both teams had multiple chances to win it, neither was successful in capitalizing on them, and the game went into overtime – Temple’s second overtime game in a row and Delaware’s second of the season. Both teams lost their previous overtime affairs. The Blue Hens wasted no time trying to even their record on the season. Two minutes into the sudden-death overtime period, Delaware earned a corner opportunity and a chance to win the game. Delaware was able to put a shot on net, but Dalrymple made an impressive glove save to keep the Owls’ hopes alive. But those hopes did not last long as Delaware sophomore forward Melissa Lenoir scored the game-winning goal on an assist from junior forward Amanda McCardell shortly after. After the contest, Janney summed up the Owls’ mentality. Temple squared off against Penn State on Saturday and was unable to stop the losing streak. The Owls fell to the Nittany Lions, 4-0, despite a season-high 10 saves from Dalrymple. It was the first time Temple’s offense was shut out this season. The Owls will look to get back on track Wednesday in a home game against Drexel. Senior goalkeeper Erin Hanshue continues to have success for one of Temple’s most consistent programs. Director Amir Bar-Lev explains the story behind Pat Tillman, who was killed by friendly fire in 2004. Women’s Field Hockey went 271 minutes and 49 seconds without scoring, but won their first match of the season on Friday night.